£50 non-refundable deposit at the time of booking. Price includes gas and electric but does not include entertainment passes. These can either be purchased at Skipsea Sands Reception or arranged via ourselves. Our Atlas Amethyst is sited in the Southfield area of the park, allowing direct access to all the park amenities but at no risk of disruption or disturbance to either visitors or the abundance of local wildlife. It has a double bedroom with double wardrobe, vanity table and over-bed storage. There are two twin bedrooms, both with a single wardrobe and over-bed storage and a double sofa bed in the living area. The spacious living area consists of a double sofa (bed) with two comfortable armchairs and contains a TV/DVD/Free-sat box with a variety of DVD's for all ages to choose from. There is also a limited choice of books and games. It boasts a fully fitted kitchen, with a dining table and 6 chairs. There is a gas fire in the lounge and electric plate heating in all bedrooms. There are two toilets, one with an electric shower. Brand new fridge/freezer installed and new carpets throughout. 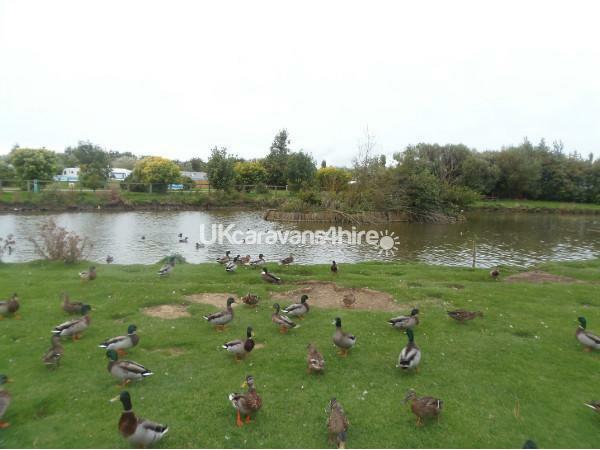 There is a grassed parking bay beside the caravan. There is a family friendly cabaret bar featuring live entertainment, lounge bar and sports bar showing sky sports. Indoor swimming pool, ten pin bowling alley, chip shop, launderette, indoor sports hall, gym, amusement arcade, two children's play parks and also a pond for fishing and feeding the ducks. Local attractions: 10 minute walk to the local beach, fishing, golf course and local pubs in nearby Skipsea There is a good local bus service to Bridlington and the surrounding areas. Duvets and pillows are provided but we would respectfully request that you provide your own bed linen and towels.